What is the Purpose of a Threshold? So what exactly is the actual purpose of a threshold? 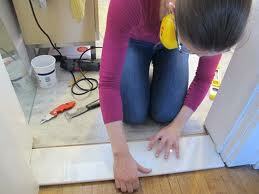 Simply put, to keep flooring from peeling up. Thresholds are typically placed at the bottom of a doorway because 1) This is where the floor will incur the highest amount of traffic and 2) This is also where one type of flooring ends and the other begins. Even if a space has the same type of flooring throughout, oftentimes, a threshold is placed at the doorway, working as seal to prevent the elements, and depending on the room, water from entering or leaving. Why Should I Upgrade a Threshold? Because thresholds are, well, thresholds, some builders may want to cheap out of their expenses and purchase the less expensive type of material like metal or wood, trying to save money. This is usually acceptable for their clients as they may have their thoughts on investing in more obvious features when building a home. Yet, buyers, whether they are prospective homeowners or businessmen, are getting smarter. They are beginning to understand the importance of upgrading certain building materials and thresholds are one of them. Thresholds undergo a high volume of wear and tear. Because of this, they usually need to be replaced. For some do-it-yourselfers, this is not much of a laborious task and the cost usually isn’t breaking the bank. However, money is money and the money spent on such an expense, especially for those who prefer to pay someone to replace their window sills, is money that could be saved. Perhaps one reason why some builders and contractors haven’t considered upgrading their threshold inventory is because they may not know what type of materials are available or where to get it. Granite is the most sought out building material. Building contractors can verify that the number one thing most homeowners are looking is granite countertops for their kitchen and bathroom. Here’s an idea: If clients are looking to incorporate granite in their kitchen and bathrooms, why not enhance the design with granite thresholds? Selecting the Absolute Black Granite thresholds can blend in nicely with existing countertops or serve as a decorative feature within the room. Stonexchange offers Absolute Black Granite thresholds in the standard double bevel as well as the single and double Hollywood Bevel. CremaMarfil thresholds will complement any design as its neutral tones can work as a seamless barrier between floors. The CremaMarfil also comes in the standard double bevel in addition to the single and double Hollywood Bevel. The Nuevo White Carrara threshold offers a classic renaissance décor to any room. This type of threshold is ideal for hotels and grand entryways. It is also a good choice for renovation projects when the goal is to maintain the integrity of an old building. This material is also available in the standard double bevel in addition to the single and double Hollywood Bevel. To achieve a pristine look, select the Pure White Thazoz thresholds as its smooth white surface will usher your project into a timeless scenery of serene tranquility. Stonexchange can also ship the standard double bevel in addition to the single and double Hollywood Bevel directly from their warehouse. For a warmer neutral tone, choose the Travertine threshold as its honey colored tones can easily hide dirt for those especially high traffic areas. Not to mention it’s light veining brightens the surface, bringing another dimension of design to a space. For investors who are in the business of flipping homes, consider upgrading the thresholds in your investment. Buyers notice and appreciate little features like this. Incorporating granite or marble thresholds can make all the difference in determining when prospective buyer might make an offer. For builders and contractors who buy and sell houses, are on a limited budget, and may not be able to afford to replace everything in a home, try only installing granite thresholds. Simply by selecting the right kind, it can make all the difference to the interior of a home. A little swap out of replacing old, beaten-down thresholds with new marble or granite thresholds may very well make an old home look like new. Make the smart investment and enhance those details that other builders may want to overlook. Upgrade your building project with marble and granite thresholds. Stonexchange Window Sills works with nationwide shippers to delivertimely deliveries and dependable service. When you are ready to go the extra mile to out shine your competition, give our team a call at 305-731-2400 or visit us online today!